This certified organic butter is obtained from the organically grown fruit of the Cocoa tree (Theobroma Cocoa). From its seed kernels the butter is extracted and further processed and refined to obtain a tan colored butter which has a very mild yet pleasant cocoa (chocolate-like) odor, suitable for cosmetics and toiletries. 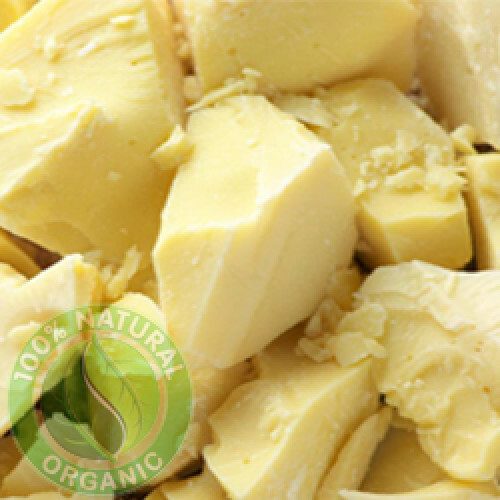 Cocoa butter is of significant commercial importance in foods, pharmaceuticals and cosmetic applications. Cocoa butter is solid at room temperature, but melts readily on contact with the skin. When adding butters to creams and lotions, it might be necessary to gently warm them until the texture can be incorporated into the final product. Using a hand blender, create a vortex with your cream or lotion and drizzle your melted butter to fully incorporate. For addition in soaps, the general rule of thumb is 1 tablespoon per pound. As with most raw materials, results may vary, so we strongly recommend small, lab scale batches prior to any commercial manufacturing. Prevents drying of the skin and development of wrinkles. Reduces degeneration of skin cells and restores skin flexibility. May enhance stability of certain emulsion systems.